Kevin Houchin saw the praise roll in for McGregor Independent School District when the Central Texas district's high school received top marks from the state in 2016 for high academic achievement and preparing students for college. 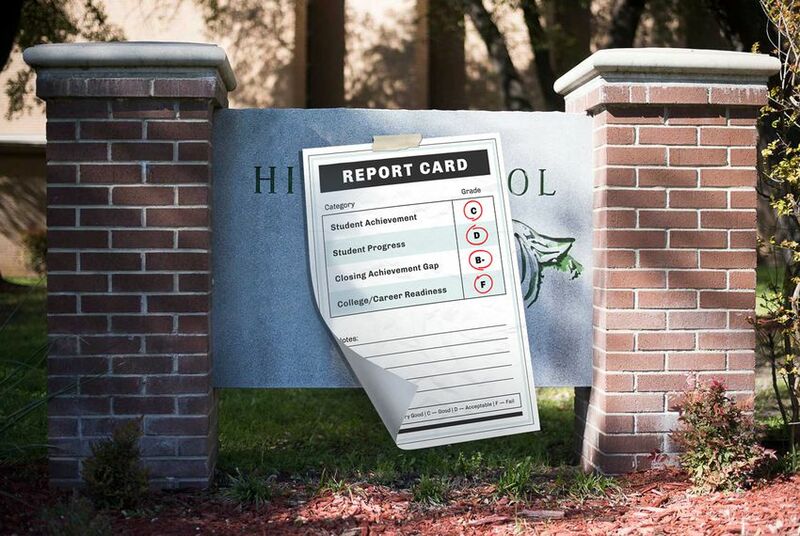 So the superintendent was surprised to see an F grade on the district's report card this month. "Our kids are doing very well. To get an F is just preposterous," he said. Other educators were bombarded with questions from concerned parents. "At morning duty, I had parents coming in and asking questions, asking, 'What does this mean?'" said Elizabeth McMurtry, principal of Chisholm Trail Elementary School in Belton ISD. All public schools and districts received preliminary grades in four categories this month, as part of the transition to a new state accountability system that will be officially rolled out in August 2018. Educators are arguing that the preliminary grades are not representative of their work in schools, are based on math too complex for parents to understand and often contradict previous school ratings. They have also argued that schools and campuses with higher percentages of low-income students have scored poorly. Supporters of the school rating system say this is only partially supported by statewide data. Texas Education Commissioner Mike Morath has been clear that these grades are not official and that the calculations behind them will change by 2018. House Bill 2804 required the Texas Education Agency to submit an early report to legislators. Meanwhile, Lt. Gov. Dan Patrick said Wednesday that A-F ratings are not going away, despite widespread criticism from teachers, principals and superintendents. The low grades show students are graduating unprepared for college, he said. "If we can grade our students — if their futures are impacted like that — our schools should be under the same grades," he said recently. The preliminary grades are for four categories: student performance on the STAAR state test, student progress on STAAR, closing the achievement gap and college and career readiness. McGregor ISD received an F in the last category, meaning they were considered to have failed in preparing students for college. Houchin, the McGregor ISD superintendent, said he was disappointed with the F because it contradicts assessments of past performance. "It doesn't give us a clear picture at all of the college readiness of our kids," he said. "That's a natural outcome of a very poorly designed system. It's confusing. It's complex, and it doesn't give an accurate portrayal of our campuses." In the existing accountability system, the TEA rates schools as either "met standard" or "improvement required." Schools can also earn distinctions for high performance or significant progress in specific areas, including college and career readiness, closing performance gaps, student progress and academic achievement in a few subject areas. The calculations for these distinctions are different than those for A-F grades in the new rating system. "You can't compare the two, 'met standard' or 'improvement required,' with a new system that doesn't go into effect for another 18 months," TEA spokeswoman Lauren Callahan said. "They're different systems and should be treated as such." Additionally, the preliminary grades do not yet include all the data necessary to make them accurate, especially for calculating college and career readiness, she said. The official grades in 2018 will be complete and accurate. But education officials have been comparing the systems and noting what they view as major discrepancies. The TEA granted McGregor ISD's high school a distinction for college and career readiness, based on 2015-16 data. This year, McGregor ISD was one of just 22 Texas districts recognized by the College Board for increasing access to AP courses and improving performance on the exams. But it received a preliminary grade of F in that category in this month's report. Similarly, the TEA recognized Round Rock ISD's McNeil High School in 2016 for student progress, closing the achievement gap and college and career readiness. But the school received C grades in the preliminary A-F ratings. "It doesn't feel appropriate at all to the work educators on this campus are doing," McNeil Principal Courtney Acosta said. She has promised teachers she will not change school policies to try and get better grades on the final ratings. Watering down AP courses and getting as many students to take them as possible could result in better grades for the school, she said, but "I'm not going to do that." Acosta is also the parent of a third-grader and fifth-grader at an elementary school that received two Bs, a C and a D in the preliminary ratings. She attributes the two lower scores to the school's higher population of economically disadvantaged students. "I'm absolutely not going to hold that against my kids' school. I love the fact that they're in a diverse community," she said. The TEA data shows districts with more low-income students scored lower in the first category, student achievement on the STAAR exam. But the other categories saw weaker or no correlations with the percentage of low-income students. But proponents of the A-F ratings argue that the new accountability system actually helps schools with more low-income students to judge their progress because one category grades how well schools are closing the achievement gap. As a former teacher, "I think this system would be very actionable for me as a teacher in my own classroom and school community," said Courtney Boswell, executive director of the conservative education group Texas Aspires, which supports stricter accountability and graduation standards. As legislators have passed laws in the past several years attempting to ease the high stakes of standardized testing for public school students, the accountability system ceased to be useful for representing school performance, Boswell said. Some educators say they worry that the preliminary grades will provide fodder for some legislators to pass a "private school choice" bill, giving parents public money to attend private schools. Patrick said during a Texas Public Policy Foundation keynote address Wednesday that he is backing "school choice" policies so that students can choose education opportunities outside of public schools with D and F grades. "That's why we need school choice. Because no parent should be forced to send their child to a school that's a D or an F or a C, or frankly any school that they don't think serves their child," he said Wednesday. Rep. Ken King, R-Canadian, who is on the short list to head the House Public Education Committee, said he agrees with Patrick that A-F grades should remain. But he said he wants to simplify the calculations behind the grades so parents can easily understand why their school or district received an A or an F.
Rep. Mary González, D-Clint, filed House Bill 843 last week proposing a return to a prior accountability system that would deem schools exemplary, recognized, acceptable or needs improvement, instead of grading them. "I knew even before the ratings came out that I would work hard to repeal A-F," she said. She said her bill does not solve all the problems educators have with the accountability system but is a good start. "If we're going to have a system, at least let's not have a system that negatively stigmatizes students and communities," she said. The state's new system of grading public schools and districts from A to F is barely starting to kick in, and many educators are already intent on killing it. Correction: An earlier version of this story said that McGregor ISD got a preliminary grade of D in the category of college and career readiness. The district got a preliminary grade of F.